You may soon see doctors and nurses holding a large 20" tablet PC when they make their rounds or view medical images. Panasonic recently announced their 20-inch Toughpad 4K UT-MB5, the world’s only tablet PC with an amazing 4K resolution display. With its crystal clear Ultra HD display, processing power and portability, the Toughpad 4K offers healthcare providers and medical facilities the highest resolution display available on a mobile tablet computer for viewing medical images, training, modeling and analysis. Los Angeles, November 7, 2013 – Panasonic, an industry leader in reliable and innovative mobile computers since 1996, tonight at a Hollywood event announced the U.S. availability of the Toughpad 4K UT-MB5 tablet, the world’s first 20-inch tablet with a 4K resolution display. Part of Panasonic’s Toughpad line of professional-grade tablets, the device is designed for professionals in fields where visual clarity and collaboration are essential to productivity, such as video production, architecture, design, photography and healthcare. With its crystal-clear, immersive display, the Toughpad 4K UT-MB5 also can be utilized in settings such as museums, training centers, sales showrooms and galleries. The business-rugged Toughpad 4K UT-MB5 is powered by an Intel® Core™ i5 vPro™ processor, features Windows 8.1 Pro and offers a brilliant 3840x2560 pixel display that goes beyond Ultra HD resolution. With a 20-inch IPS Alpha LCD screen featuring 230 pixels per inch, a 15:10 aspect ratio and wide viewing angles, the Toughpad 4K UT-MB5 provides a lifelike viewing experience unlike any tablet on the market. Moreover, since the system is built on the Intel vPro platform, it bridges the gap between the needs of IT professionals and workers by including unique hardware enhanced security features, remote manageability and capabilities designed to increase end user productivity and data protection. 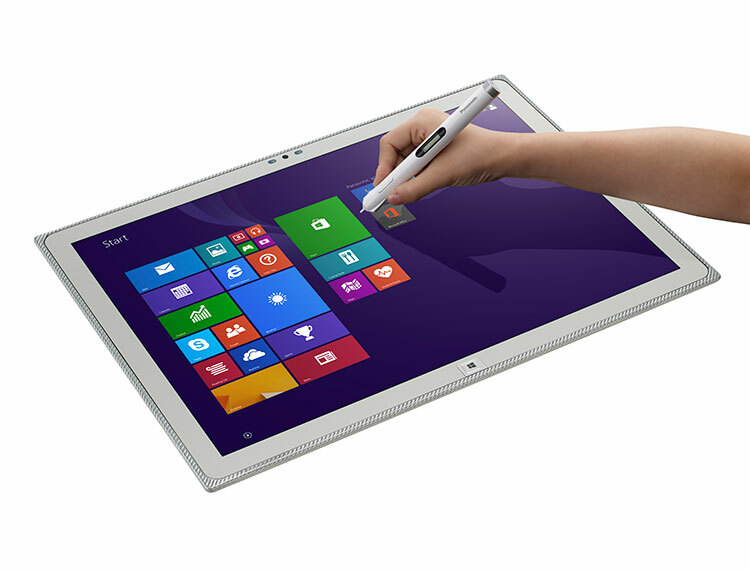 In addition to its 10-point multi-touch input, the Toughpad 4K UT-MB5 comes with an optional Panasonic Electronic Touch Pen, a unique new device offering pixel-level precision and a distinctly pen-and-paper-like feel for freehand sketching, annotation or handwriting. The pen uses infrared signals to distinctly read each pixel on the screen and communicates with the tablet via Bluetooth®. For natural and highly accurate drawing or handwriting, the pen can be held from various angles and can interpret more than 2,000 levels of pressure. The Toughpad 4K UT-MB5 is the world’s lightest and thinnest 20-inch tablet*. With a magnesium alloy frame enclosed in a reinforced glass fiber case, it provides business-rugged durability worthy of the Toughpad name. It’s built to handle a 30-inch drop to its back while operating, and 12-inch drops to 26 angles when nonoperational. Combined with accessories such as the optional Panasonic desktop cradle and carrying case solution, the device can be used as both a desktop PC and tablet. The cradle offers USB 3.0 x3, Ethernet and HDMI-output connectivity. A VESA-compatible mounting adapter plate will be available early next year. The Toughpad 4K UT-MB5 adds to Panasonic’s ever-expanding suite of technology for producing and consuming 4K media, including the 65-inch VIERA® WT600 Ultra-High Definition 4K TV and the BT-4LH310 LCD production monitor. The Toughpad 4K UT-MB5 was unveiled at an event this evening in Hollywood, Calif.